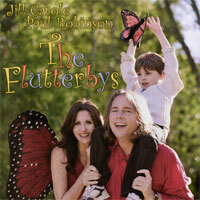 About The Artist: The Flutterbys, Jill Carole and Paul Robinson, spread their musical wings after the birth of their son, London. From a very early age, London’s large eyes would brighten at the sound of song. Jill and Paul entered London’s enchanted world by animating his jungle wall-hangings, giving them voices with individual theme songs. Thus, early tunes “Mr. Giraffe”, “Esther Elephant”, “Mrs. Zebra” and “Mr. Lion” were born. Both Jill Carole and Paul Robinson broke ground as pop musicians; Jill as an adult-alternative songwriter, and Paul as an amazing and versatile lead guitarist and songwriter. Paul has shared the stage with such legends as David Sanborn, Don Was, Bob Weir, Al Stewart and Dan Hicks. Jill was signed to UK’s Mystic Records and has toured England, opening for The Zombies’ lead singer, Colin Blunstone and Al Stewart.